The number of veterinary graduates seeking advanced education through residencies and internships has steadily increased over the past several years. According to the American Veterinary Medical Association (AVMA) data, 30.2 percent of veterinary graduates pursued residencies and internships in 2012. This number increased to 34.8 percent in 2013. In 2014 there were 1,056 veterinary residents and 332 veterinary interns at AVMA accredited institutions in the United States. In the long term, the completion of advanced education (particularly through veterinary residencies) can yield much higher salaries for veterinarians. In the short term, however, interns and residents earn much smaller salaries than what they could have earned by entering private practice immediately after graduation. The high cost of veterinary education makes this a difficult decision, as students are faced with paying off substantial loans after graduation—and those payments can be equivalent to a monthly mortgage. Veterinary residencies are defined by the AVMA as “advanced training in a specialty in veterinary medicine that is intended to lead to specialty certification in an AVMA-recognized veterinary specialty organization.” Residencies usually require three years to complete. The AVMA survey of 2014 found that the average salary for veterinary residents was $30,916. The average salary for residents ranged from a low of $23,976 to a high of $40,972 per year. The average salary for residents increased by 1.9 percent from 2012 to 2014. The salary for veterinary residents did show some variation between regions. Residents in the West earned the highest salary average of $35,881 per year (16 percent above the average for all residents). Residents in the Northeast earned the next highest salary average of $33,795 per year (9 percent above the average). The Midwest ($30,398) and South ($30,081) were the lowest paying regions for residents by average salary per year. 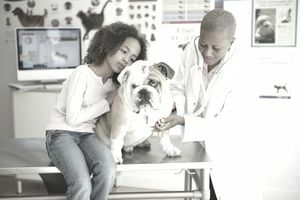 While the average salary for a veterinary resident is much lower than what they could expect to earn in their first year of private practice, residents that go on to become board certified specialists can earn double the average veterinary salary. Top paid specialists with the highest median incomes include ophthalmology ($199,000), lab animal medicine ($169,000), pathology ($157,000), surgery ($133,000), internal medicine ($127,000), radiology ($121,000), and theriogenology ($121,000). Top performers in these specialty fields can earn much higher salaries than the median. In comparison, veterinarians that did not pursue a board-certified specialty earned a much lower median income of $91,000 per year. Veterinary internships are defined by the AVMA as “clinical training programs that emphasize mentorship, direct supervision, and didactic experiences including rounds, seminars, and formal presentations.” Internships generally take one year for the intern to complete. In 2014, the AVMA reported that the average salary for veterinary interns was $26,191. The average salary for interns ranged from a low of $22,751 per year to a high of $34,200 per year. The average salary for veterinary interns increased by 2 percent from 2012 to 2014, about the same rate of salary increase as veterinary residents. The salary for veterinary interns only varied slightly between regions. Interns in the West earned the highest salary by average, bringing in $27,323 per year (4.1 percent higher than the average for all interns). Interns in the Northeast earned the next highest salary average of $26,963 per year (2.9 percent higher than the average for all interns). The Midwest ($26,100) and the South ($25,457) were again the lowest paying regions for interns by average salary per year. Completing an internship can improve a veterinarian’s job prospects and earning potential, as this additional experience adds to their potential value as an employee, though the specific value of the internship is not as quantifiable as the value to residents going on to become specialists.